Buses are at risk of losing their supremacy in Auckland City’s most established commuter bus lanes, along 4.5km of Dominion Rd. The city council’s transport committee has overruled staff advice by proposing that cars and other vehicles carrying at least one passenger be allowed into the 11-year-old lanes, as part of a $50 million-plus upgrade of the route. In a move condemned by minority City Vision and Labour councillors and public transport supporters, the Citizens & Ratepayers-dominated committee has decided to consult business and land owners and “stakeholders” such as the Auckland Regional Transport Authority on whether to convert them into “T2” status. That would mean buses sharing space with any other motor vehicles with two or more occupants, although cyclists stand to gain their own lanes from the four-year upgrade starting in January, 2012. Committee chairman Ken Baguley said yesterday that although council staff had recommended renewed bus lanes for the project, which will include widening the road by between 1m and 2m, the C&R caucus believed the consultation round should begin with the T2 proposal. But he promised his committee would heed submissions when considering a staff report in August or September. It will be interesting to see what this “consultation” entails, and who are considered “stakeholders” in the process. In my opinion ARTA have to flex their muscles quite significantly here (as should NZ Bus who operate the services along Dominion Road), as if the bus lanes do get replaced by T2 lanes, and the buses are slowed down, ARTA will lose a significant amount of money. This loss would come from both the decreased attractiveness of catching the bus (lowering patronage) and also the fact that more buses would be required to keep the current frequencies, because of the slower speed. Authority spokeswoman Sharon Hunter said last night that Dominion Rd was one of the busiest bus corridors outside the central business districts, and allowing cars or vans into the priority lanes would reduce the benefits to bus passengers “to an unacceptable extent or create safety risks that cannot be adequately mitigated”. Local politicians are up in arms about having to surrender their decision-making powers to council-controlled organisations (CCOs) when the Super City opens for business this November. Yet last week’s wildcat decision by the Auckland City transport committee to let cars share the buslanes on rush-hour Dominion Rd hardly supports the case for democracy. The maverick decision came out of the blue, with no expert analysis to accompany it. Admittedly, the Citizens and Ratepayers-dominated committee did have a last-gasp breath of commonsense and accept the need for consultation before the barmy ruling comes into force. Hopefully, by the time that’s completed, the new transport CCO will be in charge and will bring a little sanity back to the situation. Committee chairman Ken Baguley and his C&R colleagues had their rush of blood to the head after considering the results of an experiment which permitted cars carrying one passenger (T2) or more to share a 1.38km stretch of Tamaki Drive busway. It’s actually quite interesting to have a look at the results of the Tamaki Drive T2 experiment in a little more detail, to get some idea about how a similar change might impact on Dominion Road if something similar was to happen. A paper in the Council’s most recent transport committee agenda provides such information, and it makes for quite an interesting read. In terms of the sheer number of people shifting through the corridor, this has increased in the Tamaki Drive situation, by 200 people: mainly from those going along it with two people in the same car. Interestingly, 71 fewer single-person vehicles travelled along the corridor, perhaps enticed to “double-up” with other people so that they could skip the traffic (or perhaps because their partner drove them to work, which actually ends up with a vehicle occupancy of 0.5 as it takes two trips to get one person to work). Buses, in terms of their number and the average number of people on each bus, appear to have been relatively unaffected, and even their trips times have increased by only 9 seconds: relatively marginal. One of the more interesting things that this analysis shows, however, is the huge disbenefit experienced by those in the general lane, who are now taking almost two minutes longer each to travel along this section of road: a 54% increase. This is even though there are now fewer vehicles travelling in that lane (or in fact it might be the cause of fewer vehicles travelling in that lane). Rudman suggests in his article that it might be people chopping in and out of the T2 lane that has caused this extra congestion. Overall, the average time it takes for someone to traverse the Tamaki Drive corridor has increased from 189 seconds to 214 seconds as a result of changing it from a bus lane to a T2 lane. What this says to me is that even though it appears as though the roadspace is now being utilised more efficiently – previously 99% of vehicles used the main lane and only 1% of vehicles used the bus lane – in general the average person is now 25 seconds worse off in terms of their travel time along the corridor. Hardly a ringing endorsement of the change that suggests it should be rolled out everywhere else. While this same level of analysis hasn’t been undertaken for Dominion Road, or even modelled/estimated in any way, shape or form, I would suspect that the different characteristics of Dominion Road, compared to Tamaki Drive, would make the negative effects of such a change even more dramatic. Whereas on Tamaki Drive, prior to the change, only 22% of people shifting along the corridor used the bus lane, for Dominion Road I have heard many times that the bus lane carries around the same, if not more, people along that corridor than the general lane does. 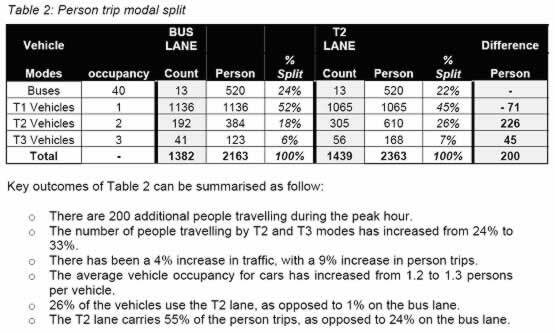 Assuming a similar proportion of general lane vehicles switch to using the T2 lane, it’s not impossible to think that around 75% of the passengers along that corridor would be using the T2 lane, but that congestion in the main lane is likely to just get worse, not better. With so many T2 vehicles mixing with a significantly greater number of buses, it’s hard to see that the delay to buses wouldn’t be significantly more than the 9 seconds seen in the Tamaki Drive example, while furthermore Dominion Road is a lot longer so any delays will simply add up to be greater and greater. With so many buses constantly stopping and starting again, to pick up passengers, I think that it would also be unlikely for the T2 vehicles to avoid delays to the extent that they can on Tamaki Drive at the moment, so that would push up the average travel time for the corridor as a whole once again. If T2 vehicles are looking to cut into the main lane of traffic to avoid being stuck behind a bus for three minutes while it loads up passengers, then one would expect this to lead to further delays happening in the main lane (it’s useful to note that the T2 lane along Tamaki Drive passes through an area with almost no rider catchment for buses and therefore almost no bus stops). All up, absolutely everything points towards changing the Dominion Road bus lanes into T2 lanes would result in huge delays for just about everyone: including bus users and those remaining in the general traffic lane. While there might be some “winners”, those car-pooling (hopefully not just being dropped at work by someone else who will then drive home) I actually doubt their gain will be as impressive as it has been on Tamaki Drive, because they will constantly get stuck behind loading buses, have to chop into the main lane, disrupt that traffic and so forth. Hopefully the consultation that Auckland City intends to undertake will look at these issues, and realise that it’s just an utterly stupid idea that deserves to be binned. In any respect, Auckland City can’t hope to actually achieve anything before they disappear in November, while it seems pretty damn obvious to me that a future Auckland Transport CCO would find such a change completely unacceptable (for the very same reasons that ARTA have objected to it so far). Therefore all the Council is really doing is wasting time and money pursuing something completely pointless. Bring on the Super City. Councils see to love wasting money investigating stupid projects, why should this be any different. In one way the slowing down of the single occupancy vehicles could benefit PT usage as it may help to encourage them to use the bus to get a quicker trip. With so many ARTA staff in high positions at Auckland Transport I think there should be a good chance of this brain explosion being stopped. Since when did buses have “supremacy” on Dominion Rd? Sure there are a couple of intermittent part time bus lanes and plenty of buses using them, but even the casual observer could see that private vehicles have supremacy on that route! A few years ago I worked at an organisation that managed to “retire” its ineffective CIO. He spent his month’s notice period finishing off some strategy documents that he’d been working on. It was all kind of sad… He thought he was indispensable and we needed his guidance for the future. We were intending to bin the documents the minute he walked out the door, and wondered why he didn’t spend his lat month surfing the web and drinking beer like normal people do. I think the Auckland councils are doing the same thing. Why bother making any sort of strategic decision at this stage, knowing that the super city will start afresh? Whether it is trams looping around a building site or mad changes to bus lanes, everyone knows that the CCO won’t be bound by these decisions and will want to look at them afresh. The only explanation I can come up with is that pollies opposed to the super city want to be able to say “if we had been in charge still, you would have had a T2 lane on Dominion Rd/funny old trams/whatever so we were right all along”. That’s what I find irritating about the cit rats – rather than money being spent on determining where to install new bus lanes they are spending said money on whether they should downgrade the exisiting bus lanes. How many new bus lanes have been installed in the last 3 years that resulted from any ideas that the Banks-led council came up with? Not many if any. This sort of doubling up of decision making is another reason why I’m looking forward to the supercity, we don’t need several departments arguing with each other over a bus lane – especially when the ones making the decision (i.e. Baguely et al) literally (in my view) have no qualifications to even be making these decisions (except for being a car driver – much like Joyce I guess). Would it not be better to also look at the actual numbers of people being moved in the bus vs. T2 vs. general lanes? Public Transport opponents often cite the relative ’emptiness’ of bus lanes, as opposed to car lanes, which are often ‘full’. What they don’t consider is that 15m of bus can carry (and often does at peak times) the same number of people as 600m – 700m of cars at 50k/h. This is certainly not the whole picture but would be an interesting factor to consider when considering the benefits of bus lanes vs. the cartoonish inefficiency of general vehicle lanes. However, it would require bus operators to actually divulge ridership numbers. Dan – They have done that, the top table shows that there were 13 buses and with an average of 40 people per bus that is 520 people. No political party is immune from this, they are all as bad as each other. The only thing they differentiate themselves on is what they waste the money on. There’s another huge issue for bus operators involved here – fuel. I imagine that it’s in their top 3 costs, along with wages and capital acquisitions (buses). A bus running a route with minimal stop-start and a lot of moving forward will use a lot less than one stuck in traffic. I don’t know what the effect on the bottom line is, but it must be significant. In a time when bus operators are being encouraged to recover more of their costs, saddling them with the huge millstone that will be ripping up the lane, is just crazy. Nevertheless, there are plenty of crazy people in power. Can we not let this turn into a discussion on the merits of party X or Y EXCEPT as regarding transport? George, you may be right, though as usual, it heavily depends on the subsidy / commercial route arrangements. That said, the bus companies obviously dislike this all. They just haven’t got the clout of the roads lobby, sadly. I agree ingolfson. Plenty of other places for general political debates. Regarding the potential clout of bus companies, we would never know because they never say anything. What’s up with that? I don’t think they say anything in public, but in private I imagine it’s a different story, aren’t infratil meant to behind the lobbying to change te PTMA? You are right Matt. I was thinking that they never lobby to improve public transport when I think they should. I forgot that they often lobby to ruin public transport!